Examining Nike's revolutionary cushioning system. There is no name more connected to the history of Nike Air Max, the sportswear brand's game-changing approach to cushioning that debuted in 1987, than Tinker Hatfield. Hatfield, a man responsible for a huge number of important innovations and designs along the Nike timeline, has countless times retold the story of his visit to the Pompidou Centre in France that first served as the inspiration for making Nike Air technology visible. But he doesn't deserve all the credit. Another Nike veteran key to kicking off the Visible Air revolution is Dave Forland, Director of Cushioning Innovation, who began working on the project that would eventually become the Nike Air Max back in 1985. Nike Air wasn't a new technology when Forland started out, the Nike Air Tailwind introduced the proprietary cushioning in 1978, but that cushioning had always been obscured, buried in the confines of the foam outsole and hidden from the view of the wearer. 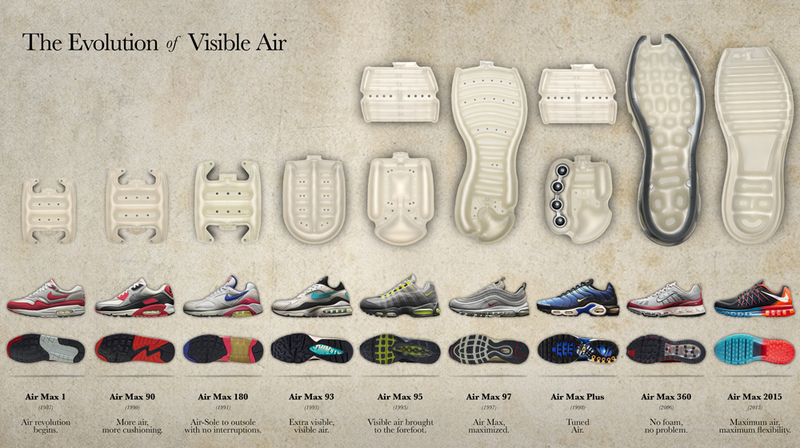 What the visible air era did was to bust open that sole, giving consumers a clear window into the tech that Nike was touting. The moment was hugely important for Nike in that it allowed the brand to deliver a clear visual message about its innovation, rather than rely on figures and promises of better performance. This approach of creating visually striking sneaker technology that conveys a clear message, be it Lunar, Free, Flyknit, or others, has been vital to establishing the identity of the Swoosh, and it can be largely linked to the bubble that first showed at the 1987 debut of the Nike Air Max 1. Dave Forland explains that a simple switch of the seams on Nike's encapsulated air units made the whole thing possible. Prior to the Nike Air Max line, these units featured the seams at the sides. A Nike designer suggested making the pieces with seams at the top, which would give people a clearer view into the exposed window. "That discovery allowed us to not have a seam along the sidewall of the unit," Forland remembers, "and provided an unobstructed view into the unit." The whole Air Max approach was very against the grain at the time, as the technology was incubated during a period when Nike was starting to scale back on the size of its air bags. 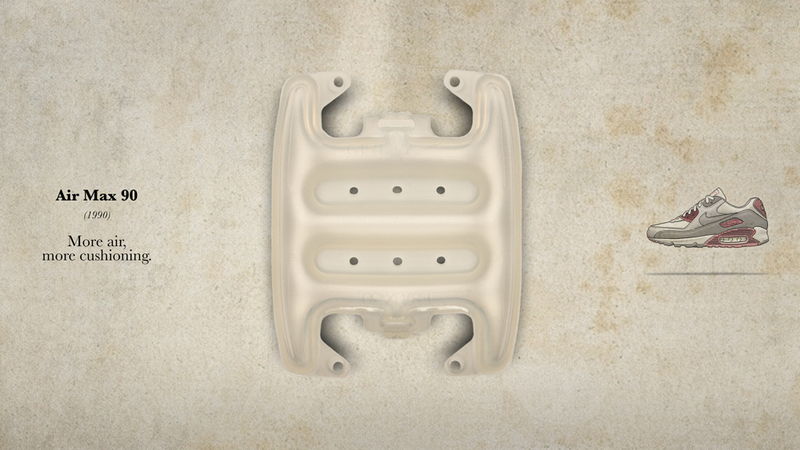 "Air-Sole units were becoming thinner and thinner to make the manufacturing process easier,” Forland says. 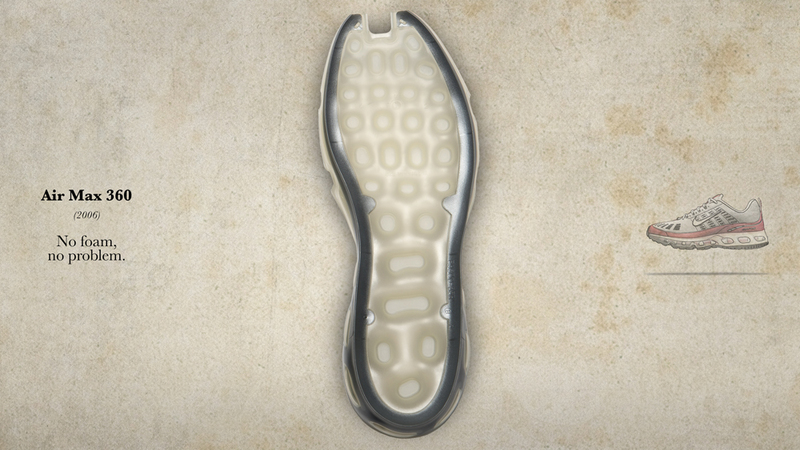 "What we wanted to get back to was injecting more air into the sole." Nike Air Max 1 (1987) - "Before visible air, Air-Sole units like the one used in the Air Tailwind were becoming thinner and thinner to make the manufacturing process easier. What we wanted to get back to was injecting more air in to the sole to achieve a strong cushioning sensation under the foot. That thought process was the first time we started talking about it as 'maximum air' or 'Max Air.'" Nike Air Max 90 (1990) - "Unveiling more and more air was the primary directive for us. The Air Max 1 and 90 both had Air-Sole units in the forefoot, but it was completely encapsulated and we didn’t have a way to make the forefoot visible with the technology that we used to make the Air-Sole units at that time." Nike Air Max 180 (1991) - "The Air Max 180 was one of the most difficult Air Max sneakers to create. It was created with the same kind of tubing technology we used in the Air Max 1, but just like with the 90 and 93 we wanted to make the Air-Sole unit larger. 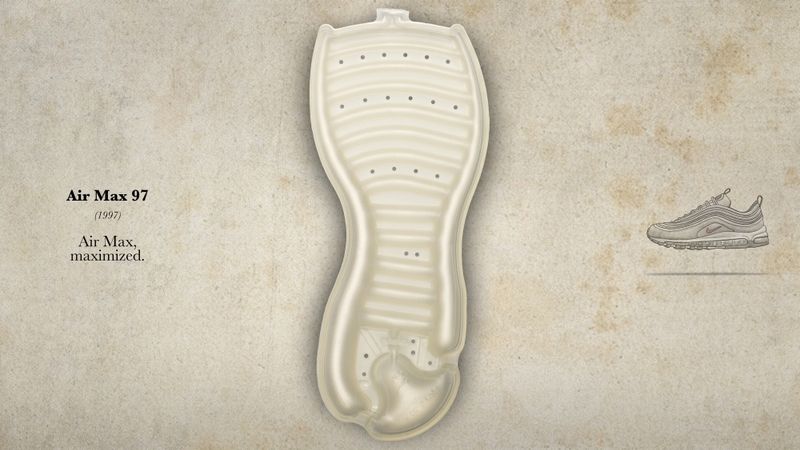 The idea was to eliminate the foam under the Air-Sole unit and mate the outsole directly to the Air-Sole unit." Nike Air Max 93 (1993) - "We weren’t close to achieving full-length air until we developed the blow-molding technology, that was first was used on the Air Max 93. 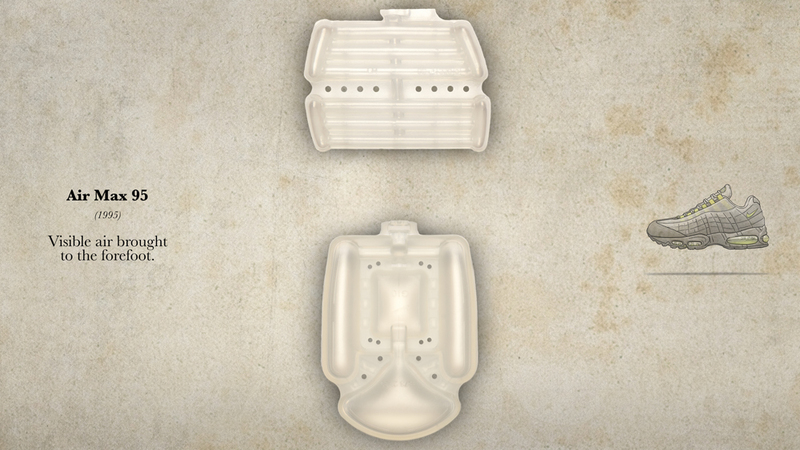 Blow molding is the process that gave us the ability to create Air-Sole units that were three-dimensional and held their own shape. Before that it was the air pressure that determined their shape, they would inflate like balloons." Nike Air Max 95 (1995) - "With this new method the air pressure would only add the cushioning properties to the Air-Sole unit. 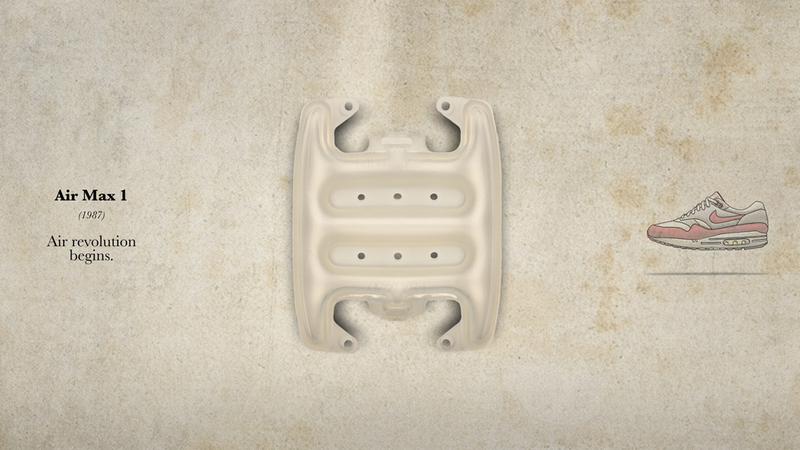 This allowed us to make the shapes needed to fit the curvature of the footwear’s forefoot. The first time we used this was in the Air Max 95, which still consisted of two separate Air-Sole units." Nike Air Max 97 (1997) - "We didn’t get [full length Max Air] until 1997. 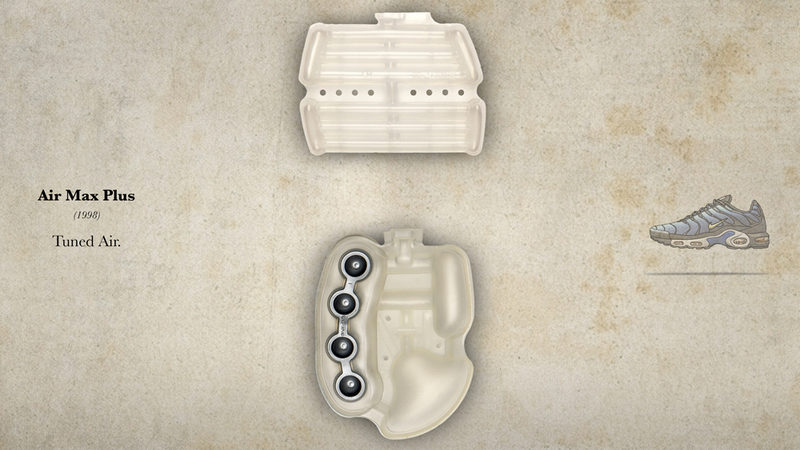 In that two-year span we figured out how to create an interconnected unit where the heel and the forefoot were integrated. 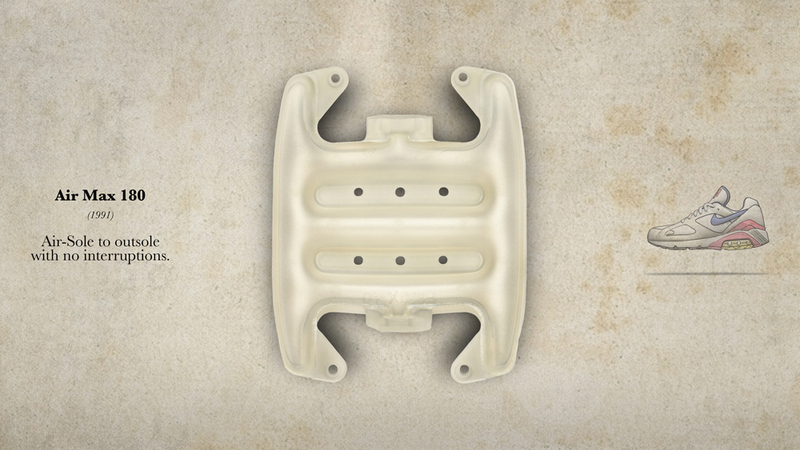 To do this we had to invent a way to hold the molten film we used to create Air-Sole units long enough to close a full-length three-dimension mold on it." Nike Air Max Plus (1998) - "Tuned Air, used on the Air Max Plus, was more of the intersection of mechanics and air cushioning. Imagine Nike Shox and Nike Air combined. It works by adding mechanical hemispheres to the medial side of the Air-Sole unit, which increase stability in the shoe." Nike Air Max 360 (2006) - "The objective of the Air Max 360 was to try and completely remove foam from the shoe making equation...What we now wanted to achieve was the sensation of riding on air. 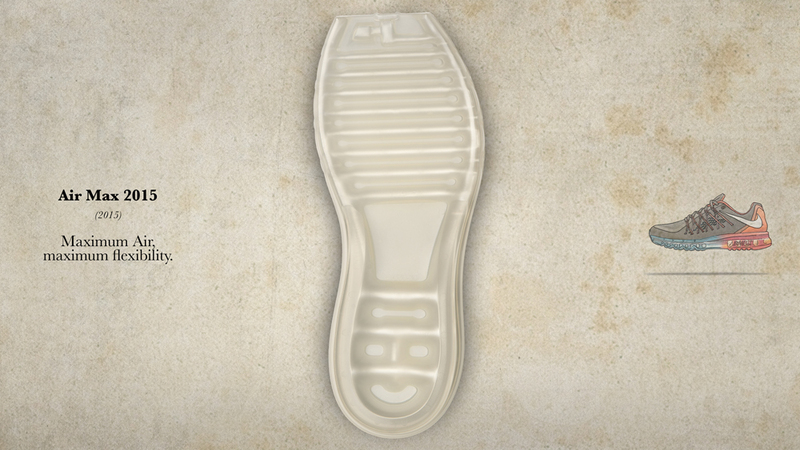 Taking the place of foam in the 360 was a caged Air-Sole unit. In fact, the Air Max 360 was the only Air Max sneaker featuring Caged Air, Caged Air that is traditionally used in Zoom Air applications." Nike Air Max 2015 (2015) - "As I said before, over time foam will break down but air never loses its properties. Also with less foam we can put more air underfoot, which was one of our original goals as well. At this point we knew very well the performance attributes of Nike Air. It’s exciting. 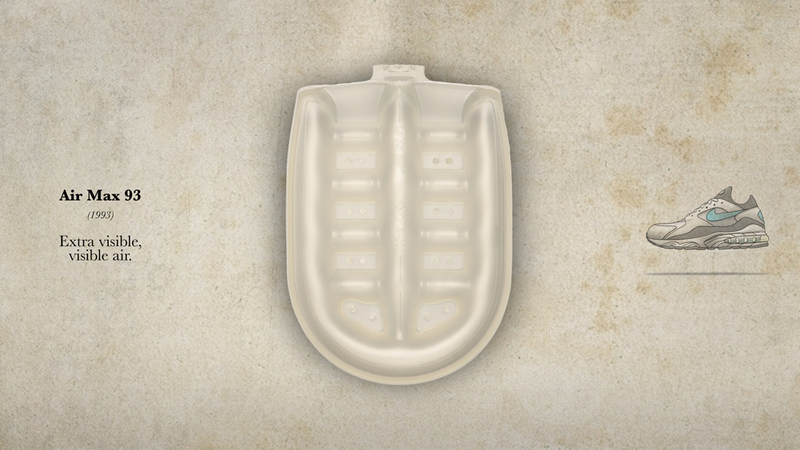 I remember the first blow-molded Air-Sole unit, we worked so hard on that and had no idea if people would embrace it. "